Traditional and Wet-on-wet Oil painting techniques. Basic Traditional and Wet-on-Wet Oil Painting techniques explained. There are many different ways to paint but the two most commonly used ones are, Traditional (indirect painting), a slow and controlled method. Wet-on-wet (direct painting) with this method, the painting is usually completed in one sitting, often referred to alla prima - at the first. The traditional method often uses a tonal under-painting as the basis of the picture, usually grey (grisaille) or brown (bistre) in colour. This under-painting can be created with acrylic, gouache, ink or thin oil paint, depending on the finish and style of work. The tonal values of the finished under-painting should be lighter in tone than required in the finished work, because the application of the glazes will lower the value. Often more complex in application, whereby transparent and opaque layers of paint are applied in succession. 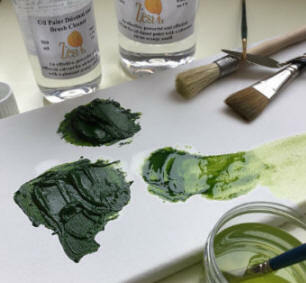 Opaque layers can be applied using a brush, painting knife or cloth, or other tools that give the desired result, they can also be applied as a scumble. The transparent layers are usually applied as a glaze of thin colour over the more opaque layers, the opaque layer being allowed to dry before the glaze is applied. The final layer of paint can be painted directly into the last glaze. Colours applied by this method usually bring a greater luminosity to the finished work than can be achieved in the direct method. In the oil on canvas picture above, the drape of the sails was laid in as a grisaille. Scumbling was used on the building to the left and glazes on the foreground water. Zest-it Clear painting medium was used throughout. First layer of paint thinned with solvent. Next layers of paint have less solvent. Next layers are tube paint - no solvent. Next layers are tube paint with a little oil. Final layer is tube paint with more oil added. When working in the traditional way it is important to work 'Fat over Lean'. 'Fat' is paint straight from the tube or with linseed oil added, this makes the paint more flexible when dry. 'Lean' is paint with no added oil or thinned with a solvent. The way it works is to start with paint that has low oil content (lean), followed by paint with high oil content, then paint with added linseed oil (fat). As a general rule of thumb, working from dark colours to light colours helps to maintain this principal. With the wet-on-wet method, the painting is completed with, in effect, one layer of paint which is usually opaque or semi-opaque. The canvas is first wetted with a painting medium, either clear or coloured. The oil paint colours are then applied with a brush and/or a knife and a small amount of painting medium. Colours are applied and left 'as is' or blended using a brush or cloth to create the desired effect. This method is ideal, especially when working outside, when the whole of the painting is completed in situ. You do need to make definite decisions about the work, before you start and as it progresses. All the elements of the painting have to be mentally handled at the same time, with regard to tone, composition, shape, form and colour, etc. Because you are not waiting for paint to dry, which allows you thinking time, you need to know your materials and techniques well before you start. You can just plan the painting in your mind but doing a sketch or drawing before starting the work can be very helpful. In the landscape painting above, the canvas was first covered with a very thin layer of Zest-it Clear painting medium. Sky and water were painted in first, followed by the background hills and land to the left. The trees on the right were added using a stippling action and the boulders at the front were painted in using a knife. You can mix paint on the palette, on the brush, with a knife or on the canvas, each will give a different effect - try them all. Mix small amounts of paint at first until you feel better able to judge quantities. Add small amounts, darks will quickly overpower light colours. When mixing colour on the brush, try not to use it like a palette knife, instead pick small amounts of the colour up with the brush. Be prepared to take the time to understand the nature of oils and what the various mediums will help you achieve. Learn about the brushes and tools you use and the best way they work for you.